What can we learn about an engaging Instagram caption from Save the Last Dance asked no one? You can do it put your personality into it, I can do it put your time into it. No one else? Okay, no… moving along then. But don’t waste this opportunity! But not everyone has your personality, little quirks or viewpoint. Writing a good Instagram caption also means you’ll receive more comments on your posts. And as we know, Instagram comments are legit gold for boosting your engagement rate. Why do Instagram comments matter? They build customer relationships: A conversation is the start of any relationship and in order to get your customers to know, like, and trust you; they gotta talk to you. Plus, it opens up the door for you to talk back. Learn more about them, get their opinion, give them advice. Ya know, friendly ways to build your ‘know, like, + trust’ factor. They boost your Instagram post: Instagram wants to see that your content is high quality + interesting to your audience. And comments are one of the best ways to show them “my audience loves this, show this to more people like them”, which in turn helps your post potentially rank in the top post section (when you use hashtags strategically), get recommended on the Explore tab, or be pushed out to more of your followers’ feeds. They promote your post organically: On Instagram, there isn’t a natural “share” button like there is on Facebook. So comments become one of the main ‘sharing’ vehicles. By writing intentional, personality filled captions, your audience will naturally want to share with their friends. You wouldn’t tag your friend in a boring lame salesy post; but when that caption connects with you and your pee laughing over that feeling of “ahhhhahah omg this is so us”, well… you’re tagging the ish out of your friend (are kids still saying ish?). So take the time to write your personality into each caption (or that of your brand). You’ll build better relationships with your customers, earn more comments (which means you’ll be working WITH the Instagram algorithm), and help your brand stand apart from the thousands of other small businesses. BOOM. What if you knew exactly what to post to each day to turn likes into sales? This post is a sneak peek from IG90: Creative Instagram Plans — It’s the first part of the Lesson “Writing Captions that Matter” where I cover 4 ways to write better captions. Learn more about IG90 and see how you can connect + convert your customers with an Instagram account that sells for you. Want to feel confident in what you're saying on Instagram? What if you knew exactly what to share to bring your customer into your brand and get her excited? After this guide, your words will be flowing like wine and your captions will get the people TALKINNNN"
Yasss! You're almost in! 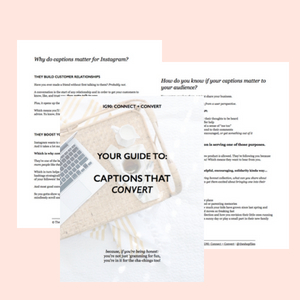 Check your email to grab your guide to captions that convert + 30 Instagram prompts for shop owners! Send me 30 new prompts! So let’s jump into two ways to create a more engaging Instagram caption. As a customer, what am I supposed to engage with besides just showering you with praise? It’s not that customers don’t or won’t LOVE the new cute mug. But it’s hard to make your brand stand out with a “cute mug” caption. I’m going to harp on this once more and then I promise to move on, but seriously ‘new necklace in shop! dm to buy!’ doesn’t help you stand out, build a relationship, or give your customer a reason to comment. And we all know that engagement on Instagram is what ultimately matters. Customers are drawn to buy from others that they ‘know, like and trust’ so give them a little more somethin’ somethin’ to start a conversation. Afterall, that’s the first step of getting online lurkers to turn into raving customers. Now your customer has something to grab hold of. It sounds like you’re talking to a real person and people like talking to people! Your engagement will naturally grow as followers laugh along with you or share how they’re crazy about another item their bf always gives them grief over. Plus you’ll start to build a community as your customers feel a sense of camaraderie as all the #mugaddicts come out … OR they’ll just compliment that super cute mug. So write something people can actually respond to and build a better relationship with your customers. Treat captions more like you’re talking to a friend then trying to “sell” anything – which ironically will help you sell more as you build brand loyalty and show off your personality. Repeat after me: Never leave a customer hanging. We like knowing what to do next or what’s expected of us. Sounds weird, but it’s totally true. Think about it: How many times do you actually comment on a brand’s post without being prompted? You may not even realize it, but we’re much more likely to check out that profile link or tag a friend when directly asked. Share your next (theme/experience) using #shophashtag so we can see what you’re up to! One last tip for writing better, more engaging Instagram captions? I use the Instagram post scheduler Later to upload all my images and write captions in advance. You can use their app or log in on a desktop, which I find really helps when I’m writing longer captions or cranking out a bunch of posts in a row. Plus, it’s free to use for 30 posts/month! OH! And don’t forget this step. It’s an often ignored way to increase Instagram engagement! So what do you think? Totally doable right? Share your next Instagram photos with #thecreativegrid hashtag so everyone can check out your new + improved engaging Instagram captions! This post is a sneak peek from IG90: Creative Instagram Plans — It’s the first part of the Lesson “Writing Captions that Matter” where I cover 4 tips to write better captions. Learn more about IG90 and see how you can connect + convert your customers with an Instagram account that sells for you. And because I know coming up with what to say day after day can be HARD, I came up with 30 (non-lame) Instagram Prompt Ideas just for online shops and Etsy sellers! Grab a full month of prompt ideas + your guide to creating captions that convert! Thanks Danae!! This was one of my favorites to put together since I love reading and learning more about everyone on Instagram. and I KNOW your audiences want to feel the same! I love these examples! The biggest pitfall I hit up against is losing my personality in my caption. I don’t know what it is but that little white space is HARD to talk in my everyday voice. Something that works really well for me is to type it out somewhere else, like in Buffer, my email, or even on Weird on my laptop. Thank you so much for this post – I didn’t realise how rubbish my post copy sounded until now! You’ve saved my instagram! Coming up with new and different captions to say in each Instagram post can be challenging at times. However, this post has given me inspiration and ideas to use. I love how you give examples and thoroughly explain each tip. Thank you for this great post! Yes, sometimes we just need a few ideas to get our creativity back!! glad you enjoyed this post!